Exact Replacement Oven Ignitor. 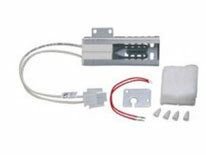 Direct replacement for Whirlpool 12400035, Electrolux Frigidaire 5312400035 and GE WB27X7934. Made in USA and SA approved. Silicon Carbide hot surface ignitor. Replaces AP4012072, 14200118, 1482-224, 1482-225, 1482224, 1482225, 3377, 41-207, 5-50735, 5-51003, 5-51207, 5-51291, 550735, 551003, 551207, 551291, 7-90023, 7-90401, 7432P025-60, 7432P025-60K, 7432P026-60, 7432P051-50K, 7432P051-60, 7432P051-60K, 7432P052-60, 7432P052-60K, 7432P062-60, 7432P064-60, 7432P066-60, 7432P067-60, 7432P076-60, 790023, 790401, AH1573892, EA1573892, F17-036, GR409, PS1573892. Fits many models.